Have you ever heard of the Virgo Diamond? No…I’m not talking about the large group of stars, comprised of Cor Caroli, Denobola, Spica, and Arcturus, also called the Virgo Diamond. I’m talking about a basically unknown and very tiny asterism in Virgo which makes a beautiful diamond shape, comprised of five faint stars. If conditions are not good this asterism can be difficult, especially the faint companion of the western-most star. When I first read about the Virgo Diamond back in 1993, I became immediately interested, and could hardly wait to see it for myself. The Virgo Diamond seems to be as unknown today as it was back in 1993. I know of only a very few amateurs who have observed this most intriguing deep-sky object. My first observation of the Virgo Diamond came on the night of April 14th 1993. I was using a 10-inch f/4.5 reflector at 190x which presented a faint grouping of four stars. I was unable to see the fifth star. The stars range in brightness from 10.9 to 13.7 in magnitude. Please don’t underestimate this very faint asterism. If conditions are not good, even the four primary stars can be difficult. Since that night in 1993, I have observed this object many times, however, always seeing only the four primary stars. However, this changed on the night of April 12th 2012. The conditions were excellent, and using a 10-inch reflector, I saw the illusive fifth star at a magnification of 266x. I could not hold the fifth companion star constantly, and averted vision was required. Exciting to say the least….after all of my attempts over the years to see the fifth star. It should be noted that excellent seeing and high magnification are essential for observing all components of the Virgo Diamond. 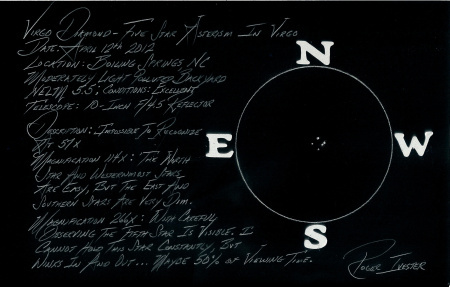 Tom English of North Carolina, using a 16-inch SCT described a fabulous view of all five stars using 194x and 387x. Fred Rayworth of Las Vegas could see the fifth star using a 16-inch Reflector at 130x, but could not hold the faint companion constantly, even from the desert southwest. Sue French of New York could see the faint companion using both a 130-mm apochromatic refractor and a 10-inch reflector. Jaakko Saloranta of Finland, using an 8-inch reflector, under less than ideal conditions managed to see the elusive fifth star, despite a focuser that kept freezing up under extreme cold conditions. The following is a pencil sketch from that special night of April 12th 2012, using only a No. 2 pencil on a blank 5 x 8 note card. The colors were inverted using a scanner. 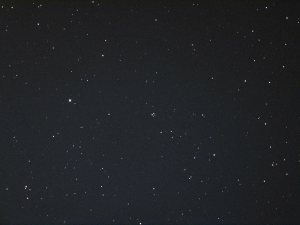 The following image was taken by Don Olive of North Carolina from the Tzec Maun Observatory in Western Australia, using an Epsilon 180 mm corrected Newtonian. I’m hopeful that you will attempt the Virgo Diamond, and if you do, I feel certain it will become a favorite springtime object for you also. Remember, it’s a tiny asterism, with very faint stars, so a good night and high magnification is a must. Good luck in your quest to see the Virgo Diamond…and the fifth and most difficult component. This entry was posted on April 3, 2012 at 3:01 am and is filed under Roger's Articles. You can subscribe via RSS 2.0 feed to this post's comments. Both comments and pings are currently closed.